Healthy hair starts at the root. Seven Oils, Lanolin, and Vitamin E add moisture at the hair root to promote healthy growth. Shake it up! 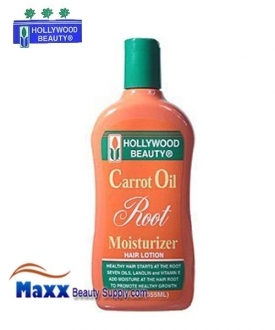 That will get the seven natural oils blended to help ensure that you have maximized everything Hollywood Beauty Carrot Oil has to offer. Use daily or more often if needed. Apply a small amount on the palm of your hand, rub hands together and gently massage into hair and scalp. Style hair as usual using a quality brush or comb. You should notice improved manageability, softer hair and less breakage with regular use.